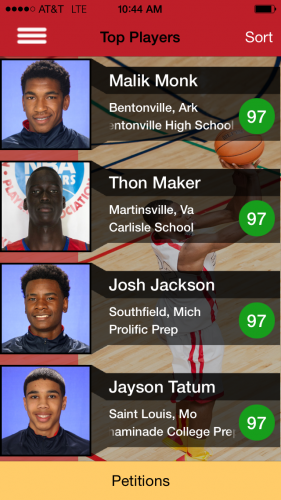 THE RANKS provides a socially intuitive platform that makes it easy for users to rate and comment on players listed in national high school basketball rankings. The Ranks is the first fan driven social platform, mobile application for high school basketball rankings. High school basketball fans across the country will now be able to use the app to digitally engage in order to rate and comment on their favorite player, petition for players to be ranked, and access headline type news about high school basketball. I learned about this Atlanta-based startup and their proprietary software from Corey Cooper, CEO and Founder, CourtCred.com, LLC. Cooper found the Sports Techie community blog after conducting a google search and finding our recent College Football Hall of Fame article. Corey invited my son and me to lunch so we could interface with his soon-to-be-released iOS app. I found him to be very professional, smart and easy to speak with. Cooper is from Atlanta, played high school basketball here, and graduated from Hampton University with a BS degree in Computer Information Systems. 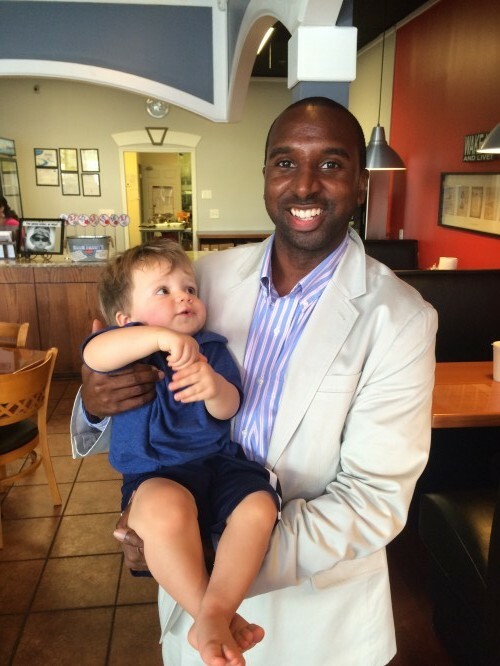 For nearly four years he has been a City of Atlanta System Administrator. He oversees all system needs for the City of Atlanta’s Department of Planning and Community Development permitting and inspection application. He also serves as the Chair of Technology Committee for Credit Union of Atlanta Board of Directors. Corey is the owner of CourtCred, a leader in grassroots media coverage of elite high school basketball that produces videography, social media marketing and blogging content. He does code but outsourced the application development to a company in the Atlanta region. THE RANKS is the first fan driven social platform, mobile application for high school basketball rankings. “Players slip through the cracks” said Cooper. His vision was to produce software that allowed fans to have conversations and offer opinions in order to influence, champion and campaign for talented high school sports players that exist in small markets, without major media outlets or top High School tournaments where they can be found. Cooper wants to, “Balance the playing field out,” with a sports technology medium that is open to the public. Players who have never been seen before are the kind of stories Court Cred witnessed over five years of operations. THE RANKS will identify and promote these players to the public, coaches and universities. To help fill the void across all states and sports, Cooper designed THE RANKS. The app was created for casual fans and sports junkies to have an opportunity to participate with contributions that influence which player is the best baller in the country via their rating system. Login is easy via a Facebook, Twitter or email account. Over 10 million athletes are active in high school sports across the United States. Most all sports have an established system used to highlight the best talent in their sport of choice. The pace of analytics growth across sophisticated ranking systems is at an all-time high but the end is not near since fans and coaches need their own place to ensure that obscure talent is a part of these quantifiable lists. THE RANKS is also an aggregated feed of the latest news and trends allowing mobile device users to have recruiting insight on high school hoops. THE RANKS was created to be the heartbeat of the company. It provides a socially intuitive platform that makes it easy for users to rate and comment on players listed in national rankings. The database ranks 500 players, 125 per class, from freshman to seniors. Locally, it ranks the top 100 players per state. It features a comprehensive, consensus listing of the top players in the country filtered and sorted by graduating class, name, hometown, and high school. The data is compiled by the some of the most knowledgeable ranking sites run by national and local prep sports scouting services that updates every quarter with the goal of producing real-time updates. Experts might include NBA number one draft pick and former GM, John Lucas. Top scout and analyst, Reggie Rankin, EBoss founder, Eric Bossi, and The Recruit Scoop founder, Alex Kline. The ‘People’s Choice’ feature is the first fan driven rating system enabling family, friends and coaches the digital option to contribute to a player’s skill breakdown. Fans can ‘Petition’ their favorite player to be ranked. Any varsity, junior varsity, sophomore, or freshman team player that is not ranked, can get listed with enough petition signatures because your opinion matters. Any petition that gathers one hundred signatures from friends, classmates and coaches will be advanced to THE RANKS governing body of scouts, camp directors and athletic directors who will go out and personally scout the petitioned player to find out if they are worthy of top listing and further marketing. This filtering process validates, weeds out lesser talent and rewards higher user activity. A player’s Twitter and Instagram information is part of their profile information. I asked about Snapchat. Cooper was very intrigued by this social network and promised to integrate it at a later date since it is such a popular platform for high school aged youth. When you click on a player’s video it takes you to a YouTube playlist. I asked about the rights to a kid’s digital likeness, especially those under 18-years old. Cooper explained that tournament and camp players sign waivers with the understanding that images obtained by credentialed media is ok for marketing purposes. As a result, Cooper and his executive team have over 800 hours of lost footage of star players that has never been released. We are talking sophomore year grade of Kyrie Irving, and background app images of 2014 number one NBA draft pick from Canada, Andrew Wiggin. They have worked the top Nike and Adidas Nations tournaments in preparation for becoming high school hoops experts. 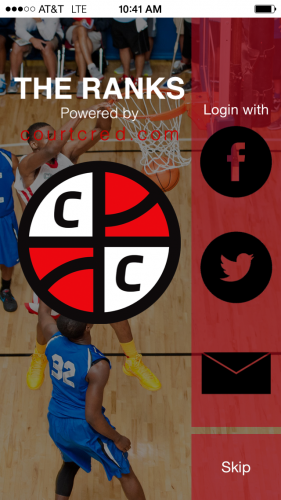 Courtcred.com is the umbrella business of THE RANKS that’s been around for five solid years covering recruitment, tournaments and breaking news surrounding high school basketball. Courtcred has the pipeline in place focused on hot recruiting news involving the best NCAA basketball programs, training camps with an agenda full of fundamentals, and ‘One-And-Done’ information for players, coaches, recruiters, and fans of high school hoops. Sports Techie, Word of mouth has long served as the chief communication tool for up-and-coming players. 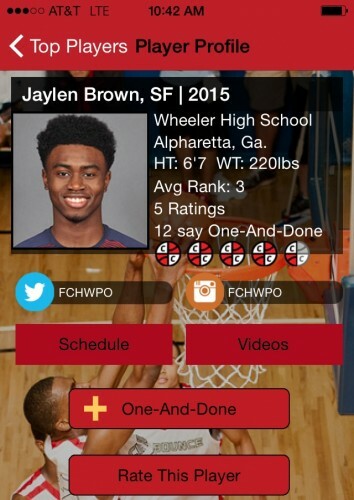 Such is the case with Jaylen Brown, Wheeler High School in Alpharetta, Georgia. Now, the local legend has THE RANKS average rank of number three overall to tell his tale. He has an overall 5 skills rating and some of Brown’s THE RANK fans believe he is indeed, One-And-Done. The One-And-Done feature is a work in progress. To be able to rate kids who may take off to the NBA after one collegiate season based on fan feedback is unique. Cooper feels that tracking and measuring the fans metrics of projected One-And-Done players is a novel opportunity offering never-before-seen insights. Ideally, the next small college Stephen Curry, Dwayne Wade or Damian Lilllard superstar will be predicted by THE RANKS fans. Revenue will be solicited from sponsors of key features. The next app features will include player tracking, more stats and advanced analytics. Girl’s high school sports, football and baseball are part of their next business development plans. THE RANKS is a free app that goes live next month on iTunes. As of yet there is no title sponsor but if you are interested contact ccooper@courtcred.com.